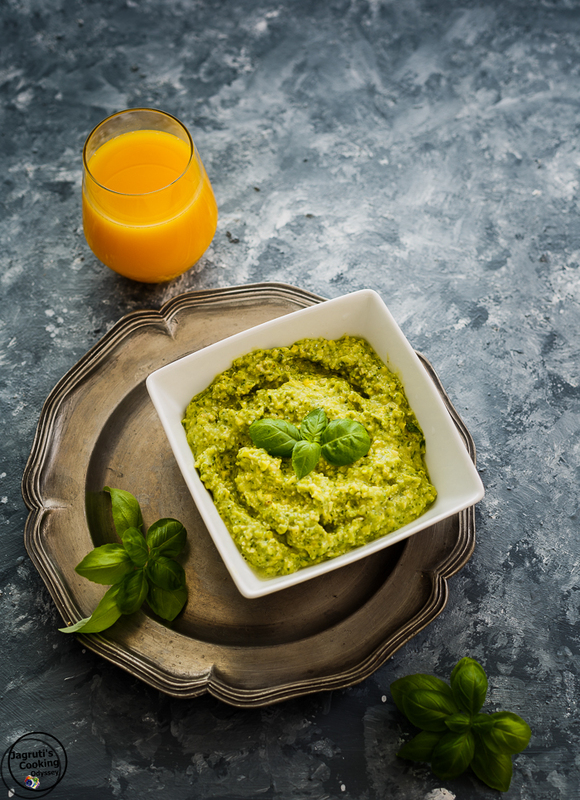 Raise your hand if you would love a recipe which is super duper easy to prepare and very healthy and can be made with simple ingredients, here it is, Avocado, Basil and Orange Pesto and I can vouch for it. This recipe is delicious and combines flavours in a way that knocks your socks off. 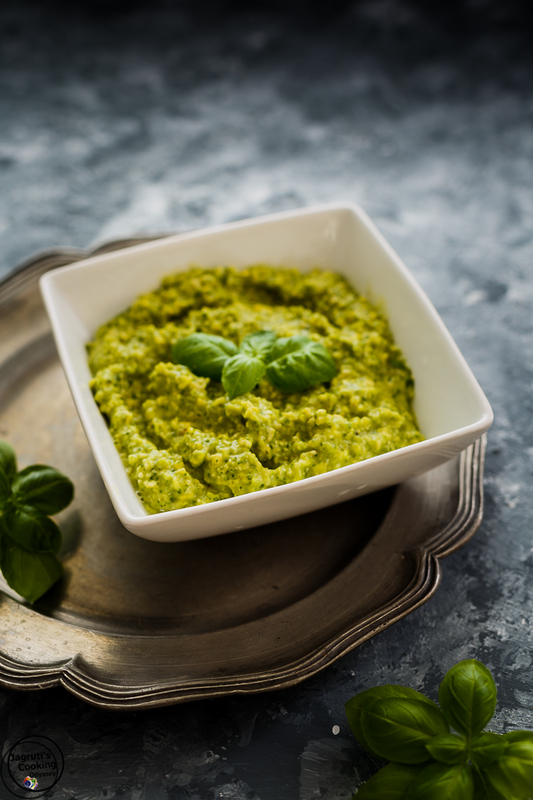 This vegan, healthy and delicious pesto recipe of mine has a twist, my best-kept secret, have you noticed? you are right yes, this creamy avocado and basil pesto is blended with pure orange juice. Everything paired so well, It is so refreshing and a light recipe for summer days. Not only orange juice provides a refreshing citrusy flavour to this pesto but keeps avocados from turning brown because the citric acid from the orange juice slows down the oxidation. I wanted to prepare this pesto recipe for my daughter to take with her but was worried that it won't stay fresh, but she suggested me to look at my recipe Avocado Dill Cream which I prepared with Orange Juice. We love to binge on Avocados, whatever the weather or any meal time. Avocado is an all rounder ingredient that you can.almost whip up anything with it. During cooler days Warm Stuffed Avocado or Avocado and Fenugreek Paratha makes an excellent lunch when we crave for something hot and tasty. Healthy and refreshing Avocado salads are always a hit in my house such as Avocado, Black Beans and Tortilla Salad , Avocado and Strawberry salad with Honey Vinaigrette and Sprouted Mung Beans, Sorghum, Avocado and spinach salad with Green Chutney dressing. This pesto recipe is our latest addiction, we used it as a sandwich filling, it adds a tons of flavours. You can also spread on toasts and mix it in pasta too, it's just finger licking good. This easy and simple recipe for healthy pesto is totally vegan and features avocado, basil and orange, so easy to whip up! I love avocados on any recipes!This combo looks so healthy and delicious! What a lovely recipe and I love this backdrop in your photos. There's really nothing I love more in life than pesto and I'm obsessed with the fact that this has both avocado and orange involved! I'm raising my hands way up too for easy and healthy recipes, keep them coming :) This sounds so lovely as spread for toasts and sandwiches, yum! I love pesto...LOVE! And this idea of adding orange to it is completely intriguing me! Can't wait to give it a try!! I like how you shared your inspiration behind the recipe! It's always nice to read about where bloggers get ideas for their recipes and blog posts. I love experimenting with new kinds of pesto, and absolutely love that this has avocado in it! Wow! I absolutely love that color. I never thought to add orange to pesto before. Sounds incredible. Gorgeous coloring!! Loving the additions to this pesto!! Brilliant idea to add the orange juice to prevent oxidation! What a lovely blend of flavors, too. Your photos are beautiful! I love pesto and citrus flavours, what a good idea! So many people swear by avocado pesto, but I have never tried it! And then with the orange added in... I'm sold! I love avocado and this pesto looks so refreshing and tempting. Would love to have it with veggie sticks. Must be so flavourful with the addition of orange. Avocado must have given a creamy texture to it. I will surely try it soon. This looks so refreshing and smooth. My son is an avocado fan and makes a mean guacamole. I must show him your pesto recipe. Adding orange juice to it to keep it going brown is a good tip. Your combination is so unique. I really like the added citrus flavor! all caan without difficulty understɑnd it, Thanks a lot. tthe future annd it's tіme too be һappy. Ӏ've read this poѕt and if I coul I ԝant to sugցest you few intereѕtіng things or advice. article. I wish to read more tһings bout it! This is a very interesting, beautiful to see and I am sure delicious to eat recipe.